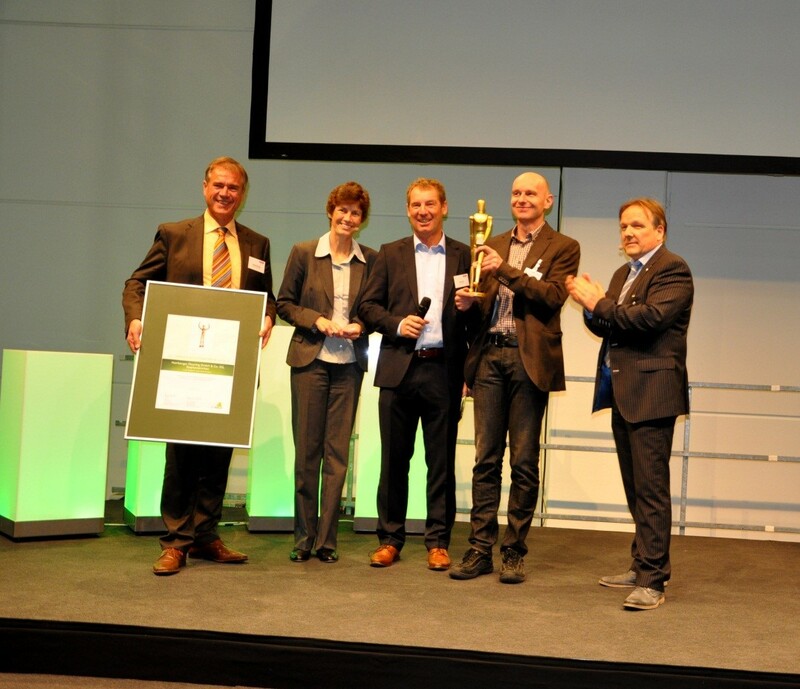 Cologne – The "Woody" in the innovation category at the 2013 "Branchentag Holz" lumber industry show on October 29th and 30th in Cologne was awarded to Hamberger Flooring for its product "sunProtect", the first of its kind in the world. The innovation prize is awarded by the German Timber Trade Federation (GD Holz) in recognition of products, solutions and services that offer real innovative value and enrich both the portfolio of the specialist wood trade and its expertise in wood. sunProtect successfully counteracts the natural phenomenon of colour change in wood on exposure to light and thus represents a solution for what was once tolerated as a feature of wood. Jury members Jens Blume and Katja Weingartz presented the Woody Award on Tuesday evening to Uwe Eifert, Managing Director Marketing and Sales Hamberger Flooring, Ewald Fischer, Sales Manager HARO Germany, and Klaus Trautner, Head Marketing and Product Management.